Of all human events, none more easily becomes an occasion for rejoicing than does a wedding. Likewise, the church wedding is one of the most sacred moments in the life of any person. More than a gala social event, it is a religious ceremony, a worship service, in which two persons, along with family and friends, invoke the blessings of God upon their union. Arrangements must be made with the pastor and church secretary for wedding rehearsals, ceremonies, and receptions so that they will not conflict with other scheduled activities of the church. All dates must be entered on the church calendar in the church office. The church secretary will handle these arrangements. The dates for the wedding and rehearsal are reserved upon receipt of the deposit. When the pastor of the First Baptist Church of Richmond is to conduct the ceremony, the prospective bride and groom should arrange premarital conferences with him in advance of the wedding date. Allow approximately one hour for each conference. A minimum of four (4) conferences will be necessary. The climate controlled sanctuary will seat a maximum of about three-hundred-sixty (360) people. Extra seating may be arranged, but adequate advanced planning is necessary. 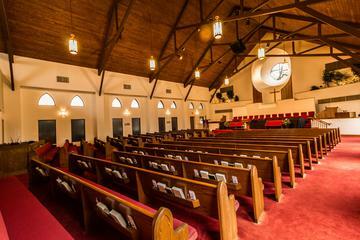 The sanctuary has a wide center aisle and aisleways on either side of the seating area. A large podium area with piano, organ, and choir loft are at the front of the sanctuary. Arrangements of any church furnishings or personal furnishings should be discussed with the pastor of the church or the Church Coordinator. Arrangements for the use of the Family Life Center, Educational Building, and/or kitchen facilities for wedding receptions must be made in advance. The church will provide only the room and its regular furnishings, excluding all kitchen items. Places for the wedding participants to dress may be arranged in advance of the ceremony. The wedding party will be held financially responsible for any damage or excessive untidiness of the building or furnishings to the satisfaction of the Church Director and Facility Coordinator and/or the responsible church committee. The church is not liable for personal items or money belonging to the wedding party.